Depending on the Domain of One’s Own setup at your school (with custom domains vs. subdomains) you will approach creating new orders for users. This article will walk you through how to create an order using a subdomain. **This applies to any user who wants to use a subdomain as their primary domain i.e subdomain.instiution’sdooo.com or subdomain.institution.edu. If your institution is using top-level domains, follow a similar guide here. Keep in mind to create orders in WHMCS, a user will have signed into the portal, but not have completed the domain registration form. In this regard, he or she will have an account in WHMCS but no product, so if need be you would create a product for them. This process would also be relevant if you wanted to give a user a second cPanel account. In this example we will create the account for jimgroom.stateu.org. After the user has signed in, navigate to their user profile. Click ‘Add New Order’ on the ‘Summary’ tab. 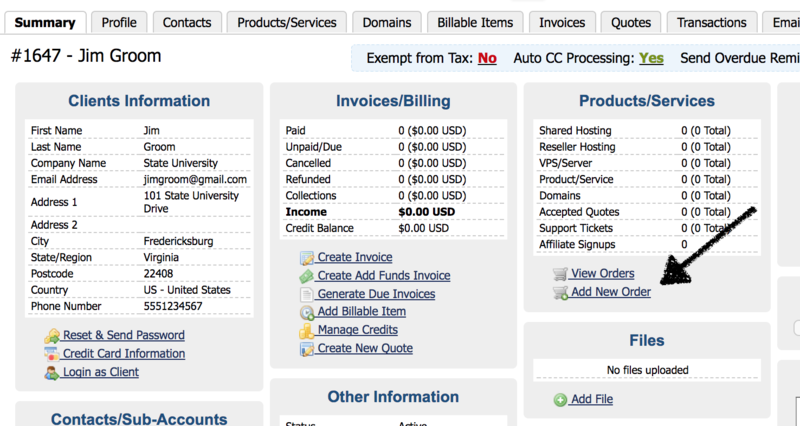 Un-check ‘Order Confirmation,’ ‘Generate Invoice,’ and ‘Send Email,’ choose the Product/Service, add the domain name, and make the billing cycle annual. Once you’re on the order confirmation page, click ‘Accept Order.’ This will create the cPanel account for the user and they’ll have access to cPanel.